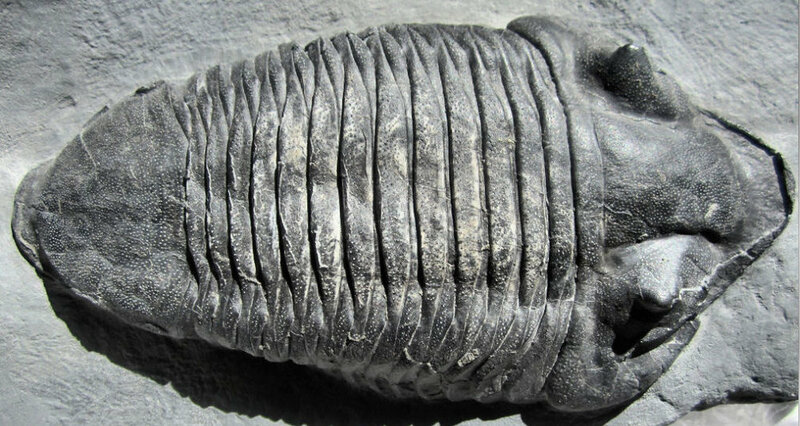 Trilobite cephalon, Eldredgeops ? or ? Unlucky break, I hate it when that happens ! This chunk broke out in a bad way. I'm pretty sure it is a portion of a trilobite cephalon but it doesn't look like the other eldredgeops that I've found here. Not certain which is fwd or rwd, but the taper of the "center section" appears to be in the wrong direction compared to my other specimens. Perhaps it is squashed/deformed a bit ? Something just doesn't look right about it to me. A few brief searches describe it in central NY, nothing about the mahantango fm in this area of eastern WV. That makes 3 different species here now, thanks again. Baker, Lost City, Moorefield, Wardensville, in Hardy County and Rio in Hampshire County. Fossil collecting in the Mid-Atlantic states with localities, collecting tips, and illustrations of more than 450 fossil specimens. The Johns Hopkins University Press, 216 pp. EXCELLENT ... I need that ! If only I could find one in its entirety. ANY one, any species. I'm going to quit counting bits and pieces from this point fwd, that might just be the jinx. This guy is the official end of the "bit & piece" count at #42. Now that the ice is broken, stand by for some spectacular finds ! Kindest regards from the Mahantango of eastern WV. If only I could find on in its entirety. ANY one, any species. This guy is the official end of the count at #42. The answer to life, the universe, and trilobite hunting. Hope you get some nice complete trilos, from the Marburg schist and Triassic diabase dykes of central MD!